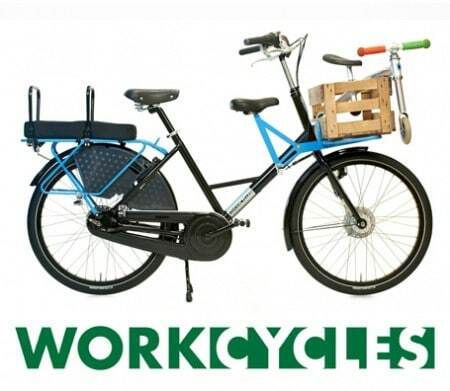 Workcycles bikes demonstrating that they’re not spring flowers. They’re built to live like this. 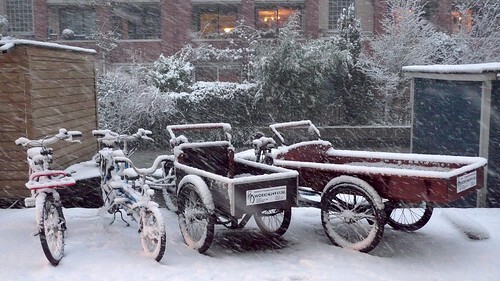 This is a slightly updated repost: Winter is upon us somewhat early this year and this is highly relevant info for anybody who cycles through the winter, especially if your bike is stored outdoors. 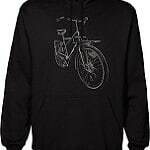 By far the most common problem that the cyclist encounters with winter cycling is the brake or gear cables freezing. This is generally the result of water condensing or dripping into the cable housing and then freezing, effectively bonding the inner cable to the housing. It only takes a tiny bit of water to do this but we fortunately have a solution. Read below for an explanation. We arrived at work yesterday figuring that the sub-zero cold, wind and snow would keep most of the customers away, leaving us with time to work on some projects. The highest priority is reconfiguring our workshop after building a massive, floor-anchored, steel frame to hang our electric bike lifts from. It’s a great improvement but not entirely our own initiative. The lifts, you see, were bolted into the 150 or 200 year old wooden beams of our ceiling… and thus the floor of the neighbors upstairs. Though the lifts are nearly new and operate very quietly they do make some vibration. Standing on the concrete (over sand) floor we never noticed this vibration but it drove the lady upstairs crazy. Actually she’s complained very vocally and angrily about a lot of things, apparently calling and writing every possible authority on a regular basis. 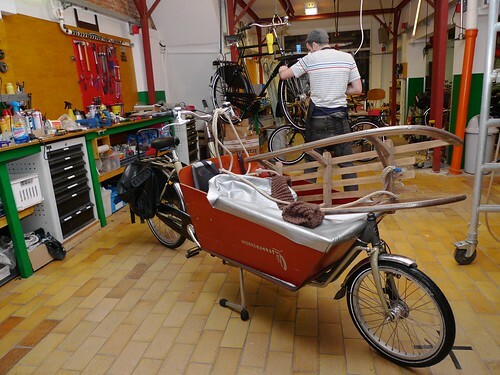 Most of her complaints have nothing to do with our activities (there’s another bike workshop next door and several apartments have been renovated), but the vibration was a legitimate issue according to the various city inspectors who visited to investigate. So the city ordered the building owner (a social housing corporation that manages tens of thousands of properties) to fix the vibration problem. It was decided that the only solution was to totally isolate the lifts from the floor beams, and the only practical way to do that was to build a steel frame all the way to the floor. We’re very fortunate and thankful that they took care of the job and paid for it. But it still requires an investment of several days of our labor to refit the lifts and lights. We took the opportunity to make them fully adjustable on both X and Y axis as well as angle, and now we’re adding more lights. I don’t think a workshop can ever have enough light. Comments one year later: Apparently the frame has solved the vibration problem since we haven’t heard a peep from our upstairs neighbor. Meanwhile the mechanics are very happy to have been able to adjust the lifts to exactly the location and angle where they can most efficiently and comfortably work. 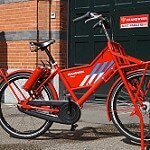 For those of you who build and repair (heavy) city and transport bikes: Such lifts are absolutely the only way to work. 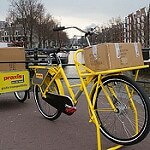 These bikes are much too heavy and unwieldy to manually heft into the workstands used in most bike shops outside the Netherlands. 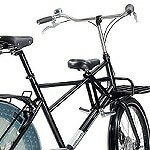 Those are intended for lighter, recreational bikes. The lifts are also highly flexible; You can lift only the front or rear, or perhaps one side of a big three wheeler. When working on something other than bikes you can simply raise the hooks above head height and then you’ve lots of free floor space – often really handy in a shop that builds and repairs wooden boxes. Mechanic: “Sure, your bike is indoors so the cable just thawed, releasing the brake. It’ll freeze again a few moments after going outside. If you can wait 15 minutes I’ll fix it. While working on this bike another snowy bike came in with the same problem, and so it went the whole day. Alexis and I pulled and flushed the cables of at least 15 bikes yesterday. 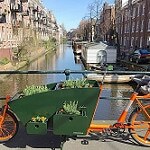 The problem is that Amsterdam bikes live outdoors, rain or shine. Tiny amounts of water drip and condense into the cable housings. On good quality bikes the cables are stainless steel and the housings are lined with polyethelene or another low friction plastic so the water doesn’t make much difference… until the thermometer goes below the freezing point. Then the cable freezes inside the housing. 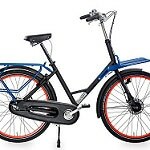 Usually it creates enough friction that pulling hard on the brake lever will overcome the friction, actuating the brake but the brake’s return spring cannot pull it back… thus locked brakes. 2. Remove the crimped end cap and make sure the end of the cable isn’t unwound or damaged. If it is either rewind, shorten or replace the cable as necessary. 3. Remove any kinks in the cable so that it can easily be pulled and reinserted through the housing. 4. Pull the cable out. 5. Seal the nozzle of a compressed air pistol against the upper end of the housing and blow everything possible out of the housing. 6. Seal the dispenser straw of a suitable light oil against the brake lever end of the housing. It might be necessary to pull the housing cap to do this. We use a generic multipurpose oil with teflon but just about any light oil should work fine. Don’t use “dry” type lubricant because it won’t displace the water for long. 7. Spray the oil into the housing until it begins coming out the other end. 5.5 Oops. Put a rag at the brake end of the housing to catch the oil coming out at great velocity. 8-9-10. Thread the cable back into the housing, readjust the brake and crimp a new end on. This fix is valid for any brake (or gear) cable but I’m basically assuming the bike has roller brakes here. Drum brakes can pull their own freezing tricks and rim brakes simply aren’t suitable for storing outdoors and riding in snow country. Now the techies can ask me why I didn’t write anything about disk brakes. 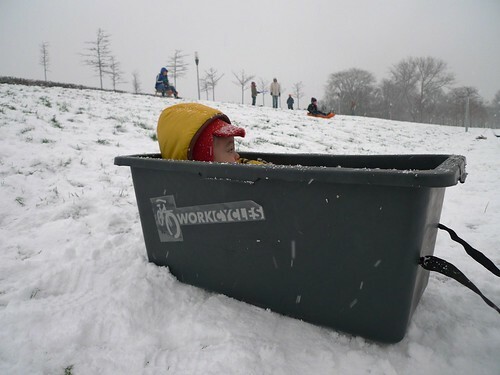 Speaking of snow, here’s a sneak peek at our surprising new development: The WorkCycles Child Transport Sled. We’re strong proponents of the K.I.S.S. philosophy (Keep It Simple Stupid) and our Sled meets the K.I.S.S. 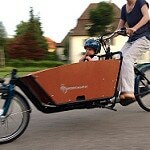 criteria beautifully: It needs no wheels, tires, bearings, towing linkage or even harnesses. Just shove the kid in and go! It’s versatile too: You can pull it while walking, tie the patented “S.T.R.A.P.” (Singular Tied/Releasable Attaching Piece-of-plastic-webbing) to your bike or even have your dog(s) or oxen pull it from a yoke. 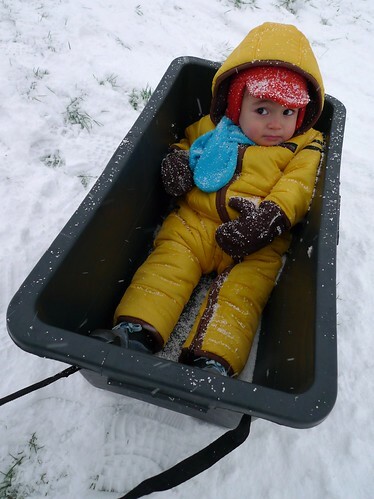 When there’s no snow it can be attached to the front carrier of your bike as a convenient transport bin. 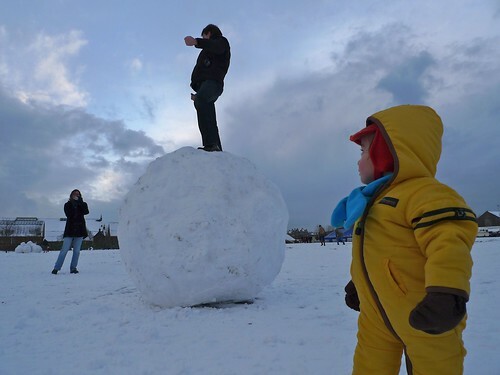 In testing the WorkCycles sled we also learned that Amsterdammers not only ride their bikes all year round in all conditions, they can also make really big snowballs. 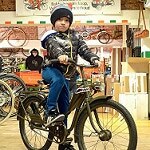 This entry was posted on Wednesday, December 8th, 2010 at 12:27	and is filed under Bikes in use, Child and family transport, Henry and his family, Practical cycling, Technical Stuff. You can follow any responses to this entry through the RSS 2.0 feed.You can skip to the end and leave a response. Pinging is currently not allowed. Does this solution usually work for a whole winter (or longer) and was it only brake problems that came in or shift/deraileur problems as well? I had the problem once last winter when it cold rrreally cold. In theory it should be good for the whole winter but occasionally the mechanic can miss a tiny bit of water or more can drip in later… and then it’s unfortunately back to step 1. Hmm… so some inexpensive or at least reliable solution operating on the K.I.S.S. 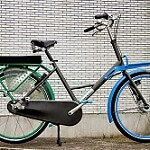 principle which could be used every time one parked a bike outside in winter could be useful? Having been so nicely given clearance, why didn’t you write anything about disk brakes? 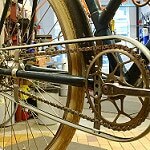 Frozen cables might never be a problem for hydraulic-actuated disk brakes (or maybe those can freeze too), but what about cable-actuated disk brakes? 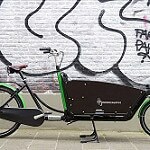 Is it the living-outdoors situation that makes disk brakes unsuitable for cargo/transport bikes, or is it something else? Are the gaps between the pads and the rotor so small that water can tend to stick there due to capillary action? I’ve never ridden with disk brakes myself but elsewhere on the internet, they seem to be well-liked by some bike commuters and others who ride through the winter. Of course I’m not arguing against the concept of disk brakes, and not even disk brakes on bikes… just not moderately priced disk brakes on bikes that live outdoors. 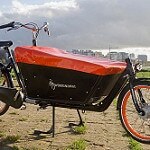 find the toughest possible solution for their “greenmachine” recumbent. As a result the full-hydraulic type brakes failed in the long run under the influence of salt in thawed snow and ice. The pads simply stuck from corrosion. This didn´t happen on the mechanical operated type. “inferior” disc brakes on their bike. Brakes were fine last night on the cold, wet ride home. Unlocked this morning to find the rear brake “jammed” which made for a difficult ride in with the brake stuck most of the time. Rather than lock up outside as usual, I brought it inside, dreading dealing with a brake repair. By the time I got off the elevator on the 8th floor it worked fine. A few minutes later when I thawed out a bit, I realized the brake cable had done the same. Thanks so, so much for this step-by-step instruction on how to deal with this problem! It couldn’t have been better timing for me, and worked perfectly. It also enabled me to see and seal some cracks in my cable housing which were likely causing the problem in the first place! I have come across your site from time to time and I really enjoy it. My name is Chuck. 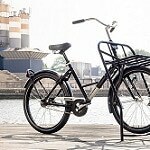 I represent Biking.com, a site for all things biking. I was curious if you accept advertising or sponsorships at all on your site. 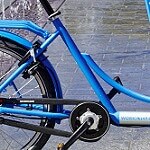 I would love to sponsor your blog with a text ad for Biking.com. Please contact me via this email should an opportunity become available. While using oil does work I find that it eventually dries up and has to be redone annually, so I have started injecting regular bearing grease into the casing. It is a tad messier to do, but stays done much longer. i hate disk brakes. just sayin’. Disk brakes have their place… but not on bikes that live outdoors and get tossed around in racks. For a perfectly tuned trials bike or mountain bike for sloppy conditions nothing beats a set of high-end, hydraulic disks. Just wanted to share my $0,02 on oiling brake/gear cables.